More often than not, a sump pump does its job. When it does not, the backup pump kicks in and helps out until the issue can be resolved. The odds of something going wrong while on vacation are no greater than they are at other times (at work, asleep, etc. ), but when a pump fails and no one is around to hear the alarm, costly damage becomes a very real possibility. Even in an unfinished basement, water can create problems. However, you cannot always be home to wait for the alarm and, even if you hear it, a beep does not tell you what is actually happening. Did the power go out? Is the battery dead? Did my pump fail? Is my house flooding? At Metropolitan, we understand that life often takes you elsewhere and you may not have the time to problem solve in a pinch. That is why we designed the Ion+ Connect digital level controller with ion sensor to be your eyes and ears when you are at home or elsewhere. And it is a pretty smart system, too. 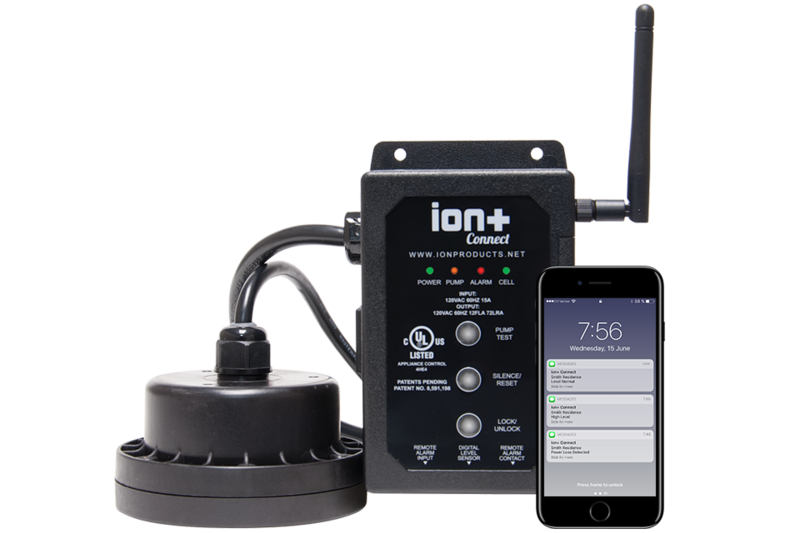 Designed to work with either a residential sump or sewage ejector pump, every Ion+ Connect leverages the power of the revolutionary Ion level sensor to ensure accurate alerts. Out of the box, the Ion+ Connect comes with an array of default notifications related to pump failure, water level, temperature, and power, including amperage draw alerts that are unique to our system. There are fourteen default alerts, each marked with an audible and visual (LED) status alert, that can also be customized to your preference to ensure that the sensor works best for you. To further enhance ease of use, the Ion+ Connect is designed to be as versatile as possible. In addition to being fully compatible with all components in the Ion family, including the Ion StormPro pump and Sumpro battery backup system, the sensor also works with most existing pumps. The real magic of the Ion+ Connect, however, is how well it works with your mobile device. Though a sump or sewage ejector pump may not initially sound like the most exciting IoT (Internet of things) smart home accessory, it could quickly become the most useful and cost saving device in your home. This system allows you to configure up to 10 different phones to receive alerts that are sent via SMS text notifications. Whether you are asleep in bed, across the street, or across the country, real time SMS alerts keep you aware of issues and, as with the notifications themselves, you can customize how the alerts are received: all at once (Alert Mode) or one at a time (Dialer Mode). The unit can even be programed to alert both the homeowner and the contractor/ plumber for faster service. So why did we choose SMS cellular over Wi-Fi? The answer is simple: Power outages. While Wi-Fi connectivity continues to take the smart-home world by storm, and for good reason, the engineers at Metropolitan recognized that a power outage would probably be the worst time for the Ion+ Connect to lose connectivity. With cellular service remaining unaffected by a power outage at home, the detection system can continue to function. And, if needed, Metropolitan’s antenna kit can help ensure cellular connectivity even in the farthest back corner of the basement. The Ion+ Connect also has a battery to keep notifications coming during power outages. Alerts are great, but they will only get you so far. Fortunately, with the unique mobile connectivity of the Ion+ Connect, alarms can also be recognized right from a connected smart phone. Or, if things seem to be running smoothly and you just want to make sure all is well, a pump test can even be initiated without ever laying a finger on the pump itself. In other words, you practically have full control of your pump right in the palm of your hand. Of course, every Ion+ Connect is also built to the same high quality standards that have made Metropolitan Industries what it is today and, with fully customizable set points up to 72”, the unit can control nearly any pit. With all those customization options, it is easy to see how the Ion+ Connect connects seamlessly to your phone, your home, and your life on-the-go, providing peace of mind at home and away. Learn more about Metropolitan’s cellular connected sump pump monitoring capabilities and our entire line of Ion Technologies sump products.